CappRondo microcentrifuge is much more than a standard basic micro centrifuge available on the market. It is extremely quiet, also under full speed operation and takes only very little benchtop space, thanks to its small footprint. Equipped with high quality suction pads, CappRondo microcentrifuge will remain stable on your desk, also by extended runs at full speed. The fresh, red color of CappRondo micro centrifuge as well as the elegant Danish design will bring life and contrast to your lab environment. CappRondo microcentrifuge has the centrifugation power of 6000 rpm / 2000 g. You can choose between the fixed speed version of CappRondo microcentrifuge, called CR-68 or the variable speed version, called CR-68X. Both versions of CappRondo microcentrifuge are suitable for 1.5 and 2.0 mL tubes. Smaller micro centrifuge tubes can be inserted using the accessory adaptors. 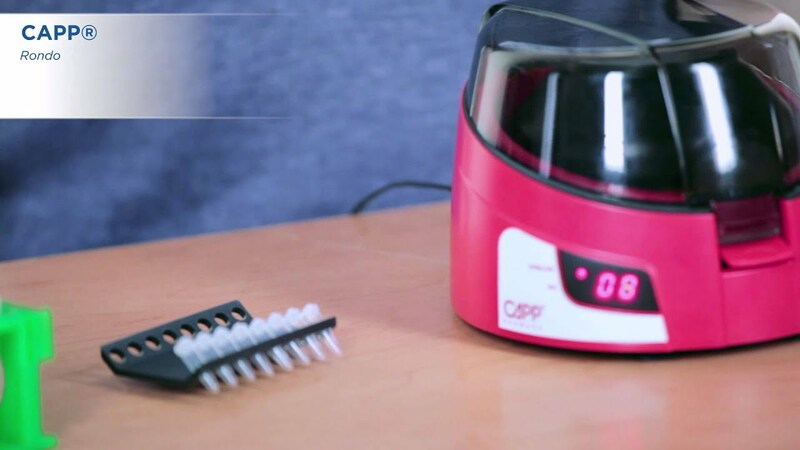 The variable speed version of CappRondo microcentrifuge offers further advanced features such as a digital display, timer function and a digital calibration function. No matter if fixed or variable speed, the CappRondo centrifuge 6000 rpm is supplied with an 8 slot closed rotor, an additional PCR strip rotor, accommodating 2X8X0.2mL and reduction adaptors for 0.2/0.4mL micro centrifuge tubes. With the user safety in focus, CappRondo microcentrifuge has been equipped with the electronic safety brake system, which prevents the lid from accidental opening until the rotor stops completely. CappRondo centrifuge 6000 rpm offers quick operation by simply closing and opening the lid. The variable speed model of CappRondo micro centrifuge offers additionally an imbalance cut-off safety feature, notifying the user, in case the tubes are loaded unevenly. Along with Capp Expell micro centrifuge tubes, CappRondo microcentrifuge will be the optimal centrifugation solution for your lab. Contact us to receive CappRondo microcentrifuge for a free trial.